The last few years, I have been walking with eyes wide open trying to see the world through the eyes of a toddler. With two in tote, it has been exciting to witness everyday with such awareness and amazement. Since the time my boys could walk, we have been out and about in single strollers, double strollers, scooters, big wheels, motorized vehicles, bicycles with training wheels and without. My favorite time of all is the days with the pushcart. I am not aware of the official toy name for it, but someone who also had two boys bequeathed this amazing little vehicle to us. By the time my second little guy gripped its handle, it was truly on its last wheels. I have since searched for such a prop to offer it to other new parents for their little ones, but to my amazement, I think we experienced the last one. There are wagons you can pull or be pulled in, but no pushcarts. Sure there are a number of miniature shopping carts; however, they have an entirely different connotation attached to them. Who wants to pretend to shop for groceries when a whole exciting world of adventures await us on the sand, grass and trails. So this amazing pushcart was the catalyst that started our rock and stick collection. Other items have found their way in the cart like shells, fossils or tiny animal bones, however, special rocks and sticks were the greatest treasures of all. Eventually, the cart became so dilapidated that we had no choice but to retire it to the recycling bin. Nonetheless, we devotedly marched on with our quest happily. 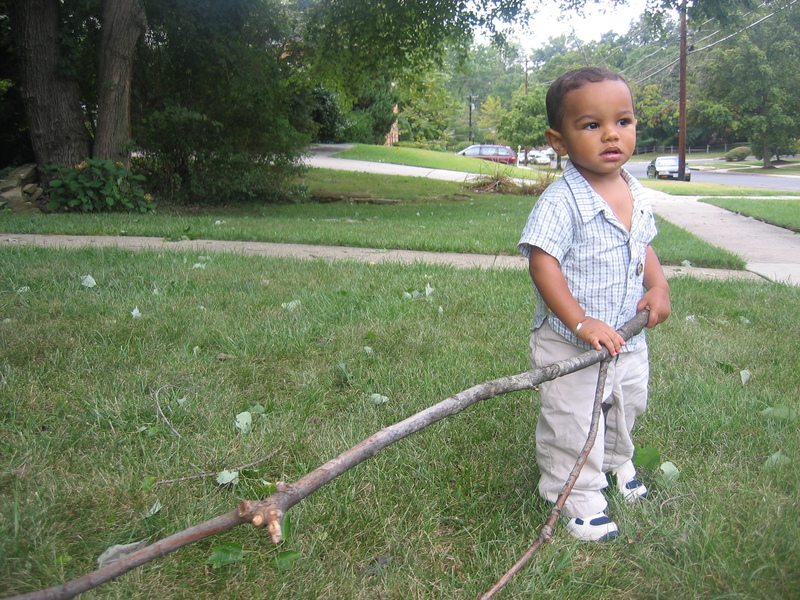 No stick was too small to be ignored and the possibilities were endless. The larger branches were the most fun to lug back home with some being triple the length of the children. Dragging the stick was no problem and fencing matches were a must as they grew older. Papa Bear sighs every time we introduce another orphaned stick into our home. I tell him that in addition to doing our share of cleaning up of the environment with broken branches, it’s art that doesn’t cost a penny. Because naturally after we transform our piece of nature into works of art, we find the perfect place for our masterpiece on our walls. The latest articles we found were some palm tree husks. The one we left as is—it was perfect. The other my son first asked for some string, then he transformed his husk into the letter A. I have seen a collection of them painted into a variety of masks by students and what a dramatic display they made in the classroom. Mother Nature is always growing. Help tidy her up of fallen branches and see how it transforms your nest.